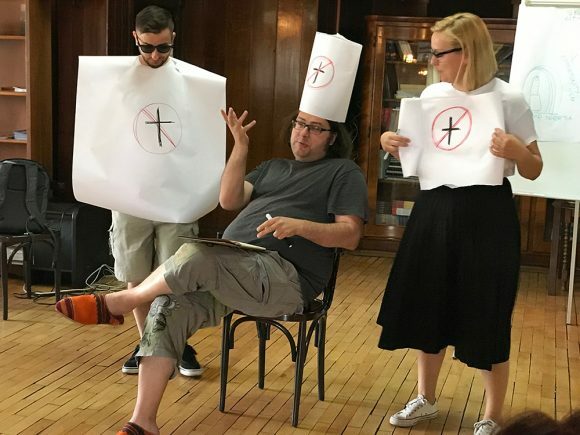 We had the privilege of training a group of artists and activists in Skopje, Macedonia from June 5-9, 2018. We were last in Macedonia training activists in 2016 before the Colorful Revolution, a series of fantastic protests against the then-government’s repressive policies and a wiretapping scandal. Now with the opposition government in power, there remains significant corruption. 36% of the population reported last year that they were asked to give bribes for services like basic health care and education, and 30% actually gave bribes. There are many infrastructure issues that go unfixed, there is less-than-free media, and rampant homophobia and other social problems. The artists and activists we worked with are looking to help inform and activate a population that does not speak out about corruption and the system that supports it. Ana Andreeva telling us about the Colorful Revolution in Macedonia. We ask participants to bring examples of artistic activism that have inspired them. Some of our favorites that this group shared: The Colorful Revolution, Brazilian artist Hugo Canuto, Rebecca Gomperts’ Woman on Waves, Pedro Reyes’s work Palas por Pistols, the work of the Russian art action group Voina, Mona Haydar’s Wrap My Hajib, and the work of Serbian group Skart. We were impressed by a number of workshop participants who have been doing their own great creative activism projects in Macedonia. 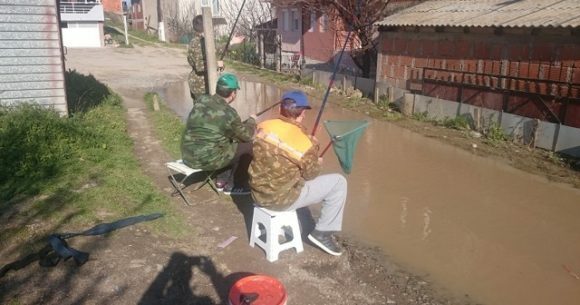 This includes actions to expose pollution in the water supply by marketing a fake new arsenic-laced bottled water, Arsena, and actions that succeeded in getting municipalities to fix basic problems by organizing fishing expeditions to huge potholes, for example. The Art Action Academy starts with the first rule of guerrilla warfare: know your terrain and use it to your advantage. We show how today’s political landscape is made up of signs and symbols, stories and spectacles, and help participants operate on this terrain effectively by understanding the historical, cognitive and social underpinnings of creative activism. Workshop exercises focus on the particular cultural terrain of the area, the audiences and the costs and benefits to them of adopting new behaviors and beliefs. We quickly move from theory to practice. In the Art Action Academy, participants work together to conceive of, organize, build and implement a creative action within 24 hours. For this action, the Skopje team wanted to do an action that would make clear the ways that people take part in corruption, as it is something so many citizens participate in but few discuss. The action included a huge red box with “Give Bribes Here” written on it, hoisted by four cape-wearing henchmen. 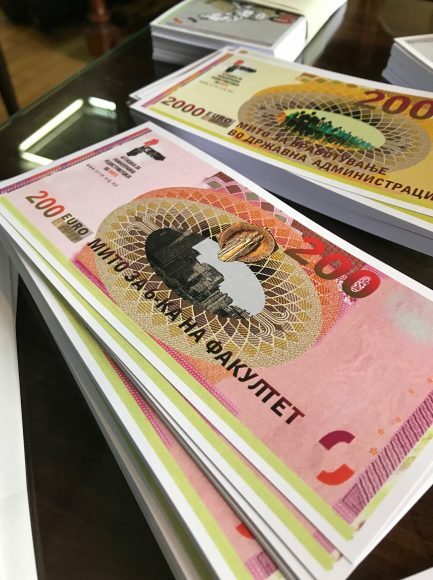 Fake bills were given to passers-by on the streets, each type of bill for a different kind of bribe common in Macedonia – for getting a better grade on a university exam, for getting a timely surgery and others. The box and bills were taken all over the center of Macedonia – to the hospital, parliament, mall and the inoperable “Anti-Corruption” government office. Participants handed out hundreds of bills and had hundreds of conversations with audiences. Press came and it was covered on local television. One of the participants, NEBOJSHA GELEVSKI, “BANE”, makes these incredible flags that are variations on the Macedonian flag, often with brilliant embedded commentary on political and social issues. He made one for us! The first C4AA flag! We love it. Thank you Bane! Since that training, we’ve gone back and worked with some of those fantastic artists to train them to become creative activist trainers themselves. 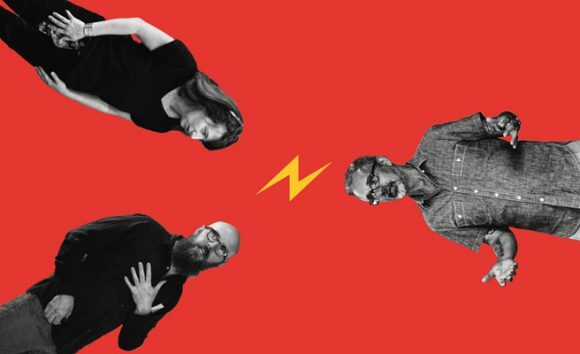 They’re part of the first West Balkan Creative Action Academy. They are working with communities throughout Macedonia, helping people who do not have a voice in the political system to use their own culture and creativity to speak up. Especially around issues of environmental concern (pollution is a huge issue in the country), government transparency, and spending around public works (infrastucture problems abound and citizens have a hard time getting even basic things in their cities fixed). For the Creative Action Academies, we don’t just teach creative activists to teach our C4AA training. We want these new trainers to bring their own expertise about their communities and their own creative and political skills to bear. Throughout 2019, we’ll continue to develop the project, and we’ll keep updates here.